"Houston of Wildwood - See Best in Futurity. 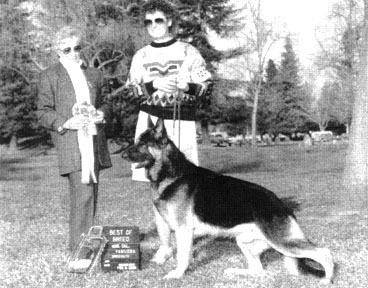 The other dogs in this class that eventually placed did not exhibit the same easy stride and coordination in movement. I would like to have seen the 2nd, 3rd & 4th place dogs in better condition with more consistent performance in the sidegait loose lead excerise. The quality of the class was very good." "Houston of Wildwood - is a medium sized black and tan with beautiful pigment. Handsome head, strong bone, and outstanding attitude. Very true coming and going, with a long suspended sidegait. I spotted him as he walked into the ring and couldn't get my eyes off him. He held up all the way under very strong competition. I hope to have the opportunity to see him again as he matures into the lovely frame he now possesses." " a lovely, deeply pigmented male. Excellent sidegait and covers a lot of ground. Handsome, but could have been in better condition. Excellent forehand but could have been a little cleaner going away. A beautiful dog to look at." "another very pleasing and attractive, mostly black with some tan male of appealing outline but not the headpiece of #1. He is a good, smooth mover who extends well, carries a firm back, and can retain his outline on a loose lead. He is clean coming and going but seemed a bit less fluid in hindquarter during the final laps."